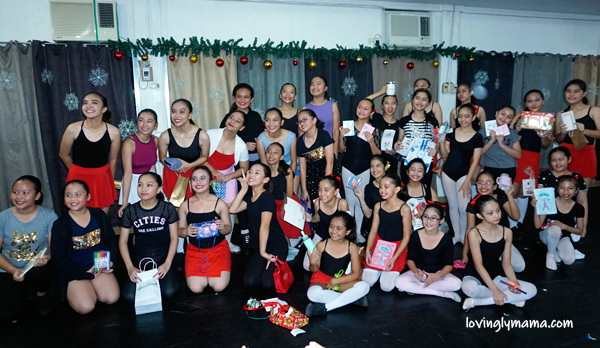 At the end of every year, the Garcia-Sanchez School of Dance holds a mini recital at their Bacolod Dance School to assess the progress of their students. 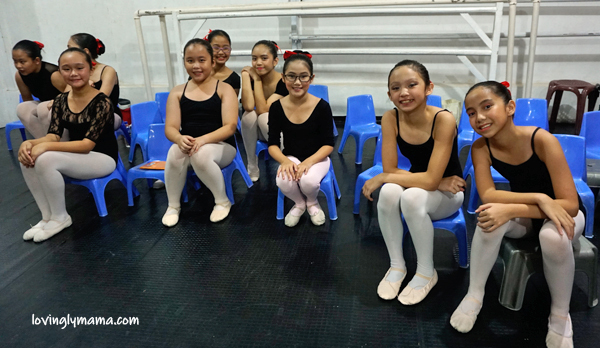 Last December 2018, we had two girls in two different ballet classes for their assessment. Now, why do we send the girls to ballet school? Why do we spend money to send our daughters to ballet school? 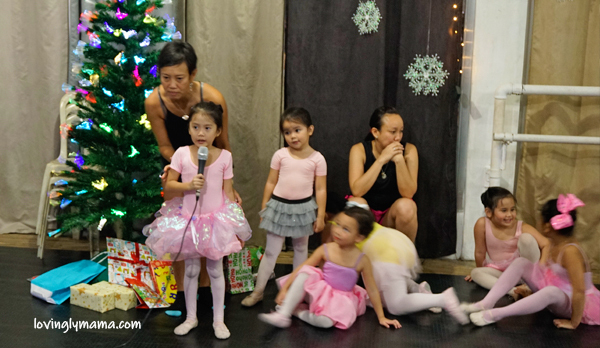 Shawna (middle) is pictured here with her classmates during their Christmas recital at the Garcia-Sanchez School of Dance. Since Shawna and Shane are of different age groups and capacities, they belong to different classes. 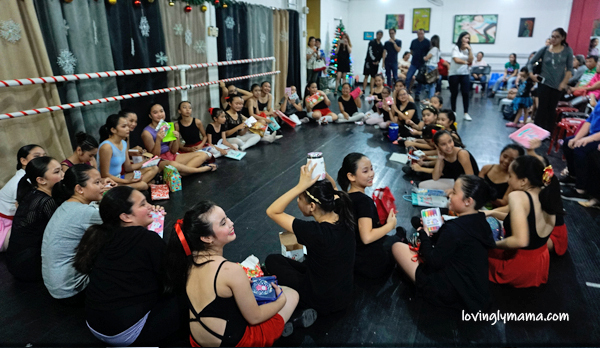 Their mini recital at the ballet school, which was also the same day as their Christmas party and exchanging of gifts, was held on different days. The girls each danced a number with their class. 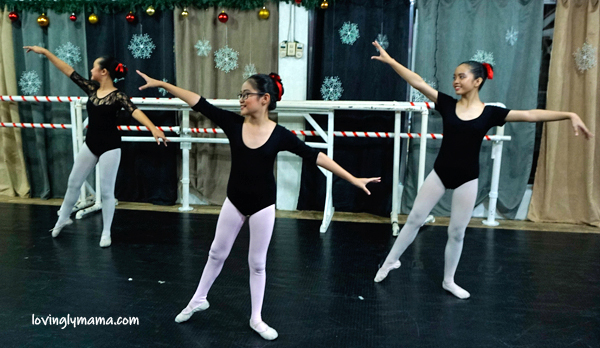 They are currently taking classical ballet at the Garcia-Sanchez School of Dance. 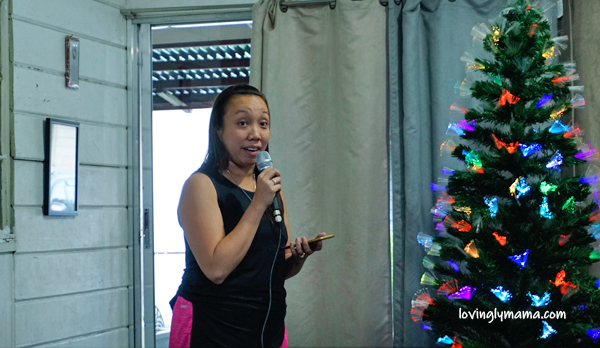 Teacher Gianne Sanchez-Sanson, principal of the ballet school, welcomes parents and explains why they hold the yearend mini recital. In 2017, I posted Shawna’s photo of a ballet pose on Facebook with an article that was written by an anonymous dance parent. I don’t think I can word it any better, as we agree with all the points that were detailed there. Shane dancing well during the last Christmas recital. But foremost, our main reason is that both our girls love to dance. Ever since they could stand, they would try to use their limbs to turn, sway, and do ballet movements. I think this is thanks to the Barbie movies that they watch at home. We don’t mind. Anyway, I have summarized that post by a ballet parent, as you can find below. We may have additional monthly item in the family budget, and now it’s multiplied by two, but we still think it’s worth it. We pay the ballet school for…. the opportunities that the girls can have. those moments when our daughters become so tired they feel like quitting but don’t. the life-long friendships forged by dance. the chance to have amazing instructors who teach them that dance is not just about movement but about life. our children to learn to be disciplined. our girls to learn to take care of her body. them to learn to work with others and to become proud, supportive, kind and respectful team members. the sisters to learn to make and accomplish goals. our daughters to learn that it takes hours and hours and hours and hours of hard work and practice to create a champion, and that success does not happen overnight. the girls to be dancing in the studio instead of playing in front of a screen. Below is my original Facebook post. We don’t just pay for dance. Instead, we pay for the opportunities that dance provides our children to develop attributes that will serve them well throughout their lives. 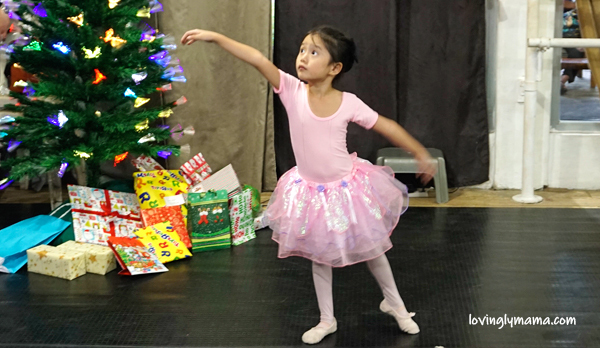 Instead of the traditional Christmas party of students, the ballet school holds this yearend mini recital so that the parents can see their children perform up close. It is an intimate gathering at the studio and a good chance for us to see our kids’ progress. This is especially endearing if your child is part of the younger age groups. Shane waits with her cousin Mika (far right) for the exchanging of gifts in their class. For example, our little Shane can be strong-willed and can throw epic tantrums. But you would be surprised at how behave she is during the show, waiting for her turn and following instructions. It’s so heartwarming. Shawna is now in the Elementary Ballet C (EBC) class. 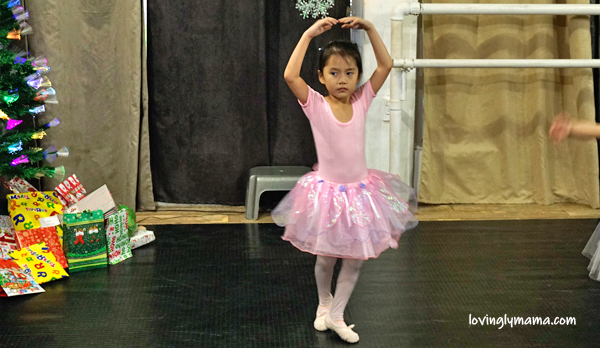 She had been going to the ballet school ever since she turned 4 years old in 2013. It is now almost six years since she first studied classical ballet. 2018 was the year that we have been most active with her Bacolod ballet classes, so she got promoted two times last year. Yes, at the school, you get promoted based on your dance development and not according to your school age or level. The teachers will not let you progress if they think you are not ready. Shawna with her classmates during their number. They started with pastel ballet costumes but now they are already wearing black leotards. According to Teacher Georgette, Shawna is a smart and technical dancer who is showing potential to take her skill further. When we saw her dance, her ballet dad and I couldn’t help but be teary-eyed. She has changed so much over the years–her style, posture, execution. We are stoked as to where ballet will lead her. Shawna is developing to become a very good dancer. Aside from just formally studying classical ballet, Shawna is also learning life lessons from the ballet school. Whenever Shane has a class that’s on the same day as hers, Papa brings her along so he will only make a single trip going to the school. Shawna with her ballet classmates. Meanwhile, Shane started with the class for nursery students. This year, she was also promoted twice and is now part of the Children’s Ballet B (CBB) class. As a newbie at 4 years old, Shane got the opportunity to dance in the grand recital last March. She threw a fit for almost an hour just before the show. Papa and I were at our wits’ end. It was just us at the St. Scholastica’s Academy gym, preparing for Shawna as well as trying to soothe Shane. We did everything we could but she wouldn’t stop crying and fussing. Her Papa then carried her outside where she fell asleep for about 15 minutes. We didn’t think she was sleepy because these kids don’t normally take naps. We just woke her up when it was almost her turn to perform. And she did like a pro, without a trace of the meltdown she had earlier. This kid can be a star while the parents were nervous wrecks. When summer came, Shane attended the storybook ballet and she also threw another fit right before the show started. The kids were asked to prepare a Christmas message of thanks for their parents. They memorized it and delivered it before the class. Shane did a good job doing hers. I dunno who helped her prepare her message, but she remembered it well. But last Christmas, Shane was totally different. Her behavior has improved, including during their required performances at Bright Kids Preschool. She has definitely turned herself around. Maybe it’s age. But then again, maybe it’s also the training. The Garcia-Sanchez School of Dance is a family-owned Bacolod dance school. It is the longest-running in the city at almost five decades of active operation. 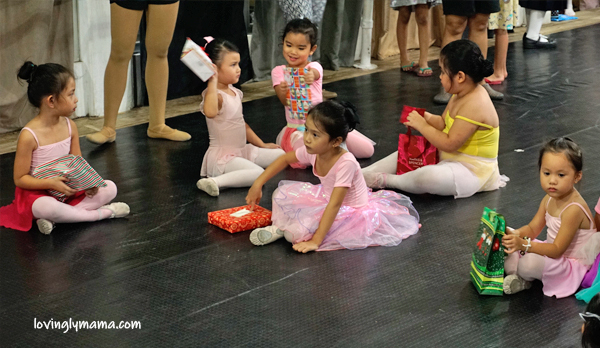 The children are under the tutelage of premier Philippine ballerinas Georgette Sanchez-Vargas and Gianne Sanchez-Sanson. Shawna’s class picture after their exchange gift. Free trial classes offered. Open for boys and girls. It sounds as though ballet is teaching your daughters more than how to dance. I guess there is such discipline required! If I have kids, I think this sounds great. We tried ballet with my youngest daughter but she did not like it. She does however love Gymnastics. I think it’s important to let your children try different things to find out what they like. When I was little, I used to attend Ballet classes because I had back issues. They said that Ballet could help me with it. After a while, I dropped from it because I was being bullied and my dancing teacher told me: “They are the ones that should dance, not you. They would learn manners here.” Never understood what she meant until today. Awwww … Yeah, I have also heard about ballet helping posture and back issues. So sad about the bullying. I haven’t heard of anything like that in the school. The teachers would not allow it. My daughter use to be involved in dance as she got older she started to get involved in other things and sadly dance had to go. I do miss it and the bond i had with the other moms. Ballet is very tactical and disciplined, I am sure they are learning so much from it. I just started my son on street dance which I am yet to know what it entails. 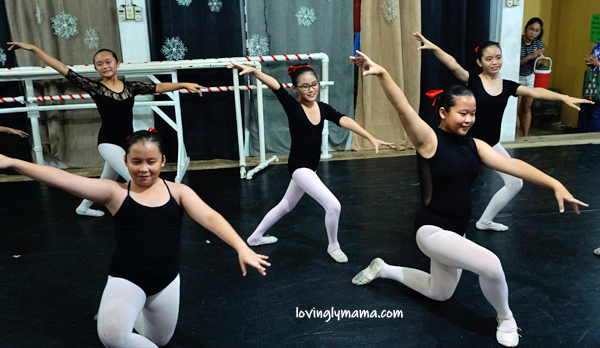 Ballet is such a cool activity for kids. I remember wishing as kid to be able to dance ballet but the money was not there for me to do so. this is so awesome! She looks like she enjoys dancing very much. I have two boys, a 2 year old and a 5 year old. My 5 year loves sports and swimming. It is very important to keep kids active and find something they enjoy doing. I feel if they enjoy it they will do their best at it. I think ballet is great for kids. My daughter did it for a year and discovered it wasn’t for her. But I’m so glad she tried it. Your post brought memories of my childhood. I was also on ballet and dance classes for the same reason you’re sending your girls to ballet classes. Beautiful post. Thanks for sharing. My daughters have been taking dance classes since they were very small. I love the confidence it gives them. My daughter loves dancing too. So, I’m looking for a dance school for her. Your post just inspired me to do it even more! Awww these girls look really adorable! I took a ballet dance for several years back then, and I agree that it was such an amazing experience to learn that dance is not merely about movement but about life. Wow! Good information you share with us! Ballet is a great dance that my niece may want to learn. Thanks for that idea. This is a great decision as it helps develops friendships and skills for many years to come. My daughter also did ballet for many years. How gorgeous! Your girls really enjoy being at ballet school. Seems that they are both terrific dancers. I’ll agree that there are greater opportunities out there to expand their capacity. I think you’ve said it at the beginning of your article, the most important reason why your girls at in ballet school is because they love to dance. If a child loves something then they should be encouraged to pursue their passions. I grew up dancing ballet and it completely shaped me into the person I am today. Now I get to share that love and passion and the lessons I learned by teaching ballet myself! It’s about SO MUCH MORE than learning dance 🙂 I’m glad your girls have found something they love to do. How cute! I can’t wait to get my daughter in dance classes! Her nana bought her tap shoes for her birthday!! I remember doing ballet when I was small. I know that I made some really great friends. Seems like a lovely little arrangement you’ve got going on! Two girls in ballet school, wow that should set back your family budget. But I guess you are right, it’s not about the money and the dance alone. They learn life skills at the ballet school, too. Going to ballet school was some of my best memories while growing up.